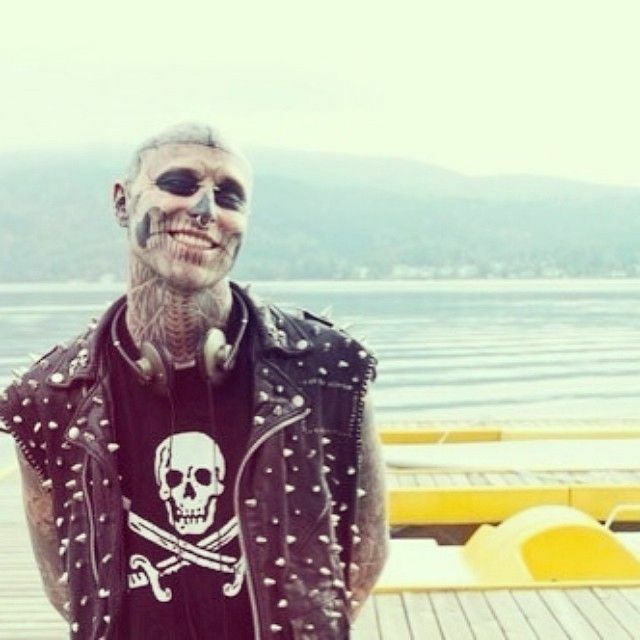 I have sat here for some time trying to wrap my head around the death of Rick Genest aka Rico The Zombie or simply Zombie Boy. When my best friend messaged me to tell me of his passing I couldn't stop my tears as they fell steady as rain. I felt I had truly lost a friend. Rick was so special to me and I want to share how he touched me personally as both an artist and person. I randomly came across a photo of him on the website Pinterest in the summer of 2015. I was so taken in by his infectious smile. It was almost hypnotizing. He had what I would call a perfect grin and his dimples were beautiful. For most he was a pioneer of body modification art or that guy from Lady Gaga's music video. For me he was my muse. His smile captured my attention and I was simply intrigued by his tattoos. A story idea came to me immediately and my idea for Beauty & The Biker was born. I couldn't get my ideas down fast enough for my dark modern twist on Beauty & The Beast. I have always been inspired by photos and the stories they have to tell. A picture truly does speak a thousand words. What was even more crazy than the fact that I wrote the book in merely three weeks time was in my story I had written about Tristian my main character being sickly as a child, not knowing Rick's background at the time. When I read his story my mouth kinda hung open and I knew it was meant to be. He was my muse but more than that he was such a beautiful soul. I became entranced by this gorgeous tattooed man and when I watched an interview with him on YouTube I became smitten. Rick had star power and charisma and he wasn't even trying, he was just being himself. He was so humble and a great sense of humor. He had this ability to draw me in and make me think about life and the world. I thought about reaching out to him so many times and had always planned to send him my book, but put it off and now it is too late to take that chance to tell him he was a friend in my eyes even though we had never met. I knew he was a wonderful person with so much love and life to give the world. He was an artist, a poet, a model, an idol...a muse and so much more to those that he touched worldwide. I hope he knew how special of a person he truly was and how many lives he touched just by being himself. I wish I could have met him and told him how he inspired me to be myself and that it was okay to be different and embrace the parts of ourselves that make us different or weird in the eyes of some. Maybe my contribution could be as small as hoping that words could turn to birds and birds would send my thoughts your way. Please note that I am not using Rick as a way to promote my book. I simply wanted to share how he had touched my life and inspired me as a fellow artist. Get Beauty & The Biker free from Amazon here Amazon Please check the price before you one click. Free promotion is for one day only.